Finding a good quality compatible ink cartridge in Galway at a price that doesn’t break the bank is not as difficult as it sounds. Most of Ireland’s online ink suppliers will now offer low cost or free next day delivery across Ireland as standard. The original brand Epson printer ink has now priced itself out of the market with a set of four colour cartridges costing as much as €80. People can no longer afford to pay these hiked up prices for printer ink that frankly is now more expensive per milliliter than champagne or Chanel No. 5 perfume. The low cost alternative to the original brand ink is the compatible or remanufactured range of inks and toners. Thankfully Epson printers, as a rule, don’t give any bother when accepting the compatibles. These ‘value’ ink cartridges are becoming increasingly more popular with families who have students printing school assignments or indeed small businesses that need to print daily runs of reports etc. 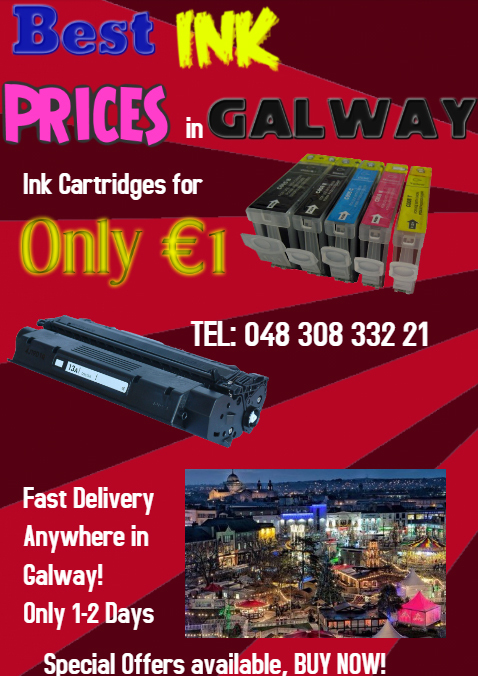 The search for cheap ink cartridges in Galway is evident as there are more and more searches on Google as people try to find the best value either locally or on the web. If an original brand Galway ink cartridge costs €20 then the compatible version of the same cartridge can cost as little as €10 online and that’s a saving of 100% for the customer. Very often the online suppliers will offer free ink or gifts as an incentive for the customer to return and keep the customer’s repeat business. It’s hard for the high street shops to compete with these incentives as their overheads make cutting profit margins nearly impossible. Epson inkjet printers usually take four colour ink cartridges, black, cyan, magenta and yellow. If one of the colours runs out then the printer will not operate without the empty cartridge being replaced. Several people find this frustrating especially if the yellow cartridges runs out and they only wish to print black and white. On a standard Epson printer it’s not possible to select black print only and its also not always known that when the printer prints a black and white image or text, it very often takes a ‘pinch’ of the other colours too to make up the black. It can be a cause of frustration to some people when this happens as they fell they duped into buying the ink when they don’t really need to. Buying compatible printer ink in Galway is the quickest way to save money and make your printing affordable at home or in the office. Make the switch to compatibles by checking out the great online offers, once you switch you may never go back to buying original brand printer ink again.